kwak Telecom Ltd was founded with the focus on providing Domestic Premium Rate Numbers (DPRN) for the European markets. kwak expands its portfolio to International Premium Rate Numbers (IPRN) and achieves rapid success. kwak Ventures is founded with the purpose to shorten the payout cycle to kwak’s customers. kwak widens its portfolio to more than 200 International Premium rate Number Ranges in more than 70 countries. kwak Telecom Germany GmbH is founded and the DPRN business is outsourced to the German subsidiary. kwak achieves an 8 figure turnover for the first time. Paycomm900 Ltd. is founded with the aim to service daily payout customers in emerging markets as South America and Africa. 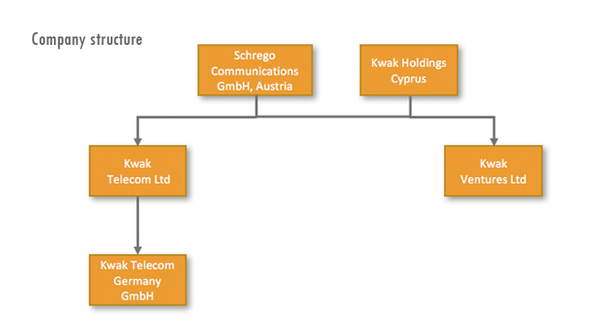 kwak Telecom Germany achieves a 7 figure annual turnover.